On 24 January 2017, solar companies Solar Capital De Aar and Solar Capital De Aar 3, of which Solar Capital is a major shareholder, awarded 26 full bursaries to students in the Emthanjeni Municipality. The bursaries were distributed at the Ministerial Bursary and Award Event in De Aar, Northern Cape organised by the Department of Energy. 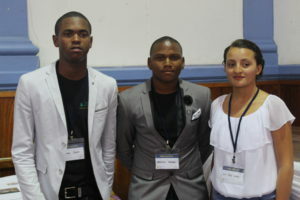 There were approximately 550 students present who were addressed by the Minister of Energy, Honourable Tina Joemat-Pettersson. Also present were Chairman of Solar Capital, Paschal Phelan, and Head of Economic Development, Janice Finlay, who spoke on the importance of providing jobs in the Northern Cape, through programmes such as the REIPPPP projects, in order to entice graduates back to their home province. The bursaries are an example of the important Economic Development the Renewable Energy Independent Power Producer Procurement Programme (REIPPPP) partners carry out in the areas in which they are involved. The bursaries will cover the full costs of the chosen degrees and diplomas of all 26 students, as well as their residential and living costs. Hi. My Name is Vuyo and a Resident in De Aar I am currently studying Electrical In Engineering and wish to have internship as per the universities curricula, I would like to know if you don’t offer such programmes for the students of De Aar? As would like to work in renewable energy one day. Thank you for your message and sorry for not getting back to you sooner. We do have a bursary programme running this year but it has already been filled unfortunately. You can contact Study Trust to find out more. Postal Address: Private Bag X16, Braamfontein 2017 Physical Address: 902 Heerengracht Building, 87 De Korte Street, Braamfontein 2001 E-mail enquiries: apply@studytrust.org.za.